I'm revisiting the book stand series today as I just came across a new resource. Bill Conrad, Jr. and his wife, Jan are the folks behind The Bookstand. They create handmade wooden book stands in Camden, ME. 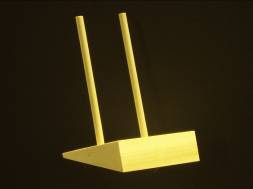 The design concept is simple - a wedge-shaped base has two dowels are inserted into it. You place your book on the base and the dowels support the back of it. The stand doesn't take up much visual space and allows your work to take center stage. The book stands come in small (4.25" X 4.25") and large sizes (5.25" X 8.5") and are made out of pine and mahogany. These could easily be painted or stained to match your booth design. 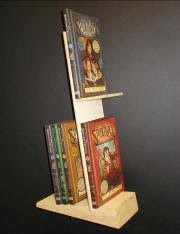 They also make a fabulous two-tier bookstand (16" high, base dimensions are 4.625" x 8.25"). You can show two books in a small footprint and as an added bonus, you add height to your display. The cost of these book stands is a bit higher than the manufactured ones, but the difference here is that you're getting something handmade. Visit their website to view their complete range of products. Many thanks to The Bookstand for granting permission for the use of their product photos in this post.